Unable to connect to Virtual Disk Service. 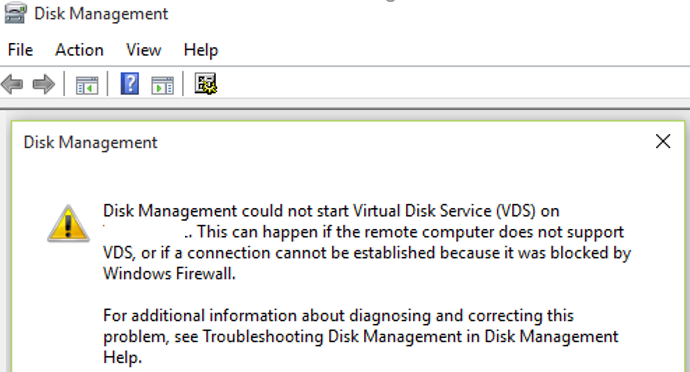 Disk Management could not start Virtual Disk Service (VDS) on Host-Name. The service failed to initialize. In normal configuration, the VDS service in Windows is configured to start manually (Startup type – Manual). It means that it should be run if necessary if other apps access it. However, in our case it doesn’t happen on some reason. A timeout (30000 milliseconds) was reached while waiting for the Virtual Disk service to connect. Windows could not start the Virtual Disk service on Local Computer. Error 1053: The service did not respond to the start or control request in a timely fashion. I tried to change the Virtual Disk service startup type from Manual to Automatic and restarted Windows. After the restart, Virtual Disk service started successfully and both Disk Management and diskpart also worked properly. Remote Volume Management — Virtual Disk Service Loader (RPC). If the Virtual Disk service doesn’t start after that, open the Registry Editor (regedit.exe) and make sure that the ALL APPLICATION PACAKAGES group in the registry key HKLM\SYSTEM\CurrentControlSet\Services\vds has Read permissions.